As a group ITW are major supplier to most European and global car manufacturers and the Swedish company is no different with the majority of their products going to various iconic Swedish brands. ITW needed reliable machines with high accuracy and low maintenance over time in order to offer their customers continuous delivery of their parts. Currently ITW is using 35 FANUC injection moulding machines in their production ranging from 15tonnes to 300 tonnes clamping force. In the future also robots will follow to do the machine tending. Reliable, precise and accurate parts production are now guaranteed by ITW to meet their customer demand for now and the future. Constant parts weight and no need for decompression can be achieved by adding the Precise Metering function. 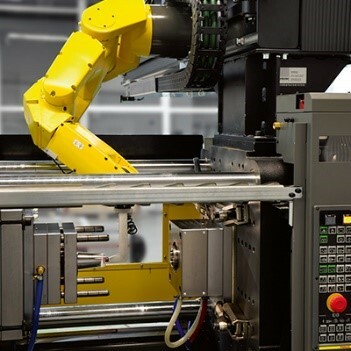 Machine tending with FANUC industrial robots make your processes even more accurate. It was in the early party of the millennium ITW Sweden was formed. Their specialism was in producing technically moulded plastic parts for automo-tive manufacturers. Today they continue their strong heritage in Sweden by producing over 300 Million parts annually for mainly automotive cus-tomers. The history behind ITW Sweden goes back fur-ther than those first days as ITW though, and can be attributed to two brothers. The Conrads-son’s were producing plastic moulds in the small Swedish town of Bredaryd in the latter part of the last century, and quickly became ex-perts in the field. As they were producing very technical moulds they soon realized they could add more value to their offer if they could test them in-house. They purchased a hydraulic in-jection moulding machine to test their moulds on, however, it was apparent from early on they needed better control over the moulding pro-cess to fully understand the characteristics of the moulds they were producing. The brothers then purchased a FANUC ROBOSHOT machine due to the powerful control, all-electric design, repeatability, and accuracy, and what has now been proved through many years of service unprecedented reli-ability. ITW Sweden took over their business in 2003 and they now have thirty-five FANUC machines in their production hall, and are also in the process of acquiring more machines this year to expand their production capacity further. The machines range from 15 tonne to 300 tonne clamping force, with the majority of the machines in the 50-150 tonne range. Håkan Lönnqvist, Production Manager at ITW Sweden, mentions “some of the ROBOSHOT machines we have in Bredaryd are nearly 20 years old. It’s very rare we have any breakdown, and the service requirements are minimal.” Like all of the FANUC range of machines and robots, the high reliability, and efficient design lead to a very low lifetime cost of own-ership. ITW Sweden currently run approximately 250 moulds across the 35 ma-chines they have in production, and this requires them to hold stock of dif-ferent parts for a period of time allowing continual delivery to their cus-tomers whilst other parts are being produced on the same machine. The ability to quickly switch moulds and set-ups is key to being able to run batch production like ITW Sweden. The parts ITW produce vary greatly from machine to machine, but the average shot weight across all their machines is only a few grams, and that is also were the FANUC ROBOSHOT has an advantage over is competition. The FANUC precise metering function improves the process stability measured directly using the part weight. 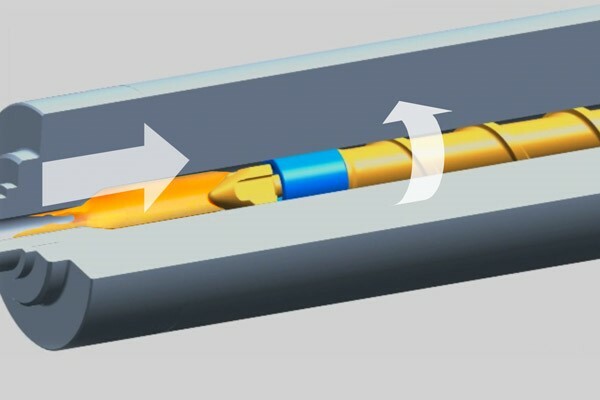 The “Precise Metering” function works by closing the screw valve prior to injection, and this is on-ly possible with FANUC’s high-speed control and monitoring of the injec-tion process. 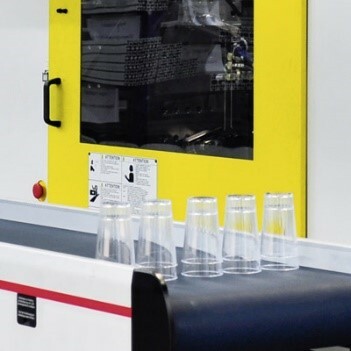 The FANUC CNC and servo drive system at the heart of the RO-BOSHOT allows for high acceleration , high repeatability of injection speeds, and the ultimate in precision of movement for injection moulding machines They are the perfect machine for large batch production of small technical parts when 100% quality in needed. Although ITW Sweden already have gantry type automation unloading the injection moulding machines they are now starting to look at replacing some of the older equipment, and looking at ways to add additional value to their production by adding 6 axis automation to some of the processes. Using FANUC robots in inspection, assembly, and packing tasks is com-mon in many European ITW sites, but not yet in Sweden. More information about the range of FANUC ROBOSHOT injection moulding machines can be found here.